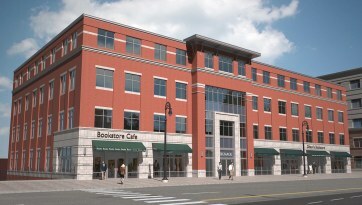 Gibson's Bookstore, Concord, N.H., will be moving from its 27 South Main St. location "to fill the entire first floor" as the major tenant of a new building at 43-45 South Main St., where construction is scheduled to begin this summer following the demolition of the New Hampshire Bindery and an adjacent building. The five-floor, nearly 70,000-square-foot building should be ready by next year. Anthology user and owner Michael Herrmann cited the demise of Borders bookstore last year and the "immediate and big jump" in sales at his store as the spark for his initial consideration of possible expansion. Gibson's will lease nearly 14,000 square feet (12,000 "usable space") in the new building, with 2,000 square feet occupied by a café. "We think about 10,000 square feet is the kind of robust independent bookstore that a city the size of Concord can support, and we hope people will support it, " said Herrmann, noting that the additional space will result in expanded hours, a larger children's section and other improvements. "This whole end of the street is becoming so much of an arts district. We're still going to be square in the middle of that." In an e-mail newsletter sent to customers yesterday afternoon, Herrmann confirmed that the relocation is expected to occur a little over a year from now. "Why are we moving?" he wrote. "We love our current space, and we love our neighbors, but let's face it: many sections are groaning with overstock, our events become mob scenes when popular authors come to town, and there's so much we know we could do better if we just had the right space to do it in. We need a bigger space; we need a better space." 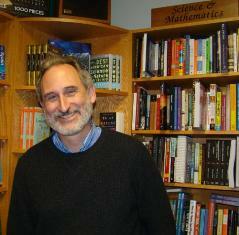 He also observed that their "primary job as booksellers in 2012 is to put up the best bookstore space we can--to provide the best argument we can for shopping for books in the real world. This new development has given us a way to do that.... All I know is that there was nowhere else in the downtown for Gibson's--Concord's oldest retailer, the oldest independent bookstore in New Hampshire, and, we hope, also worthy of preservation--to create the best version of itself, to write its own future. Because if we don't write it, it is certainly at risk." 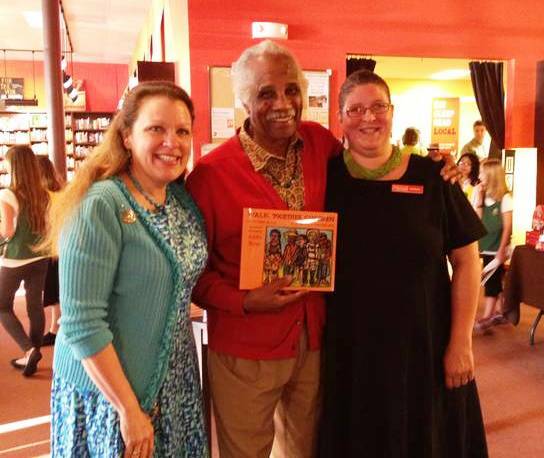 Flyleaf Books, Chapel Hill, N.C., recently hosted an event for children’s book author/illustrator Ashley Bryan that attracted a crowd of more than 140 people, including a grade-school chorus. The event held to celebrate the publication of new editions of his award-winning books Walk Together Children: Black American Spirituals, Volume One and I'm Going to Sing: Black American Spirituals, Volume Two, which are published by Alazar Press, Carrboro, N.C.
“Several years ago, Chapel Hill developer Ron Strom was looking to bring a bookstore back to Chapel Hill, to be situated in his shopping complex on Martin Luther King Jr. Boulevard. He called around the established indie stores to inquire if any wanted to open a satellite store. When he called McIntyre's, one of Keebe Fitch's staff members, Jamie Fiocco, took the call. "Ron piqued my interest," Fiocco acknowledges. And before long, she and McIntyre's co-workers Land Arnold and Sarah Carr were in business together. Fiocco serves as general manager, while Arnold is the storefront manager and Carr is the children's manager. Three years on, Flyleaf Books is flourishing, particularly making a name for itself supporting local poets and musicians. Yep Roc holds album-release parties there—two weeks ago, 130 people packed into the store's dedicated performance space to hear Chatham County Line. The Sacrificial Poets, a collective of young spoken-word artists, hold monthly shows in the store. Local writers pay frequent visits, and even non-local ones, like John Grisham, drop in whenever they're in town. Last spring, one of Chapel Hill's up-and-coming writers, Rosecrans Baldwin, launched his most recent book there. "Jamie, Land and Sarah really care about their events," Baldwin says. "They know their community, and the audience is always terrific." But opening a store—and not just any store, but a bookstore—in 2009 was not an easy undertaking. In some ways, the timing was perfect, because of the renewed interest in supporting local businesses. "We kind of came in on the upswing of the local food movement, which had kind of become the local-everything movement," Arnold says. He also points out that nationally in 2009, more bookstores opened than closed. Readers in Chapel Hill are glad that they have an indie bookstore again. 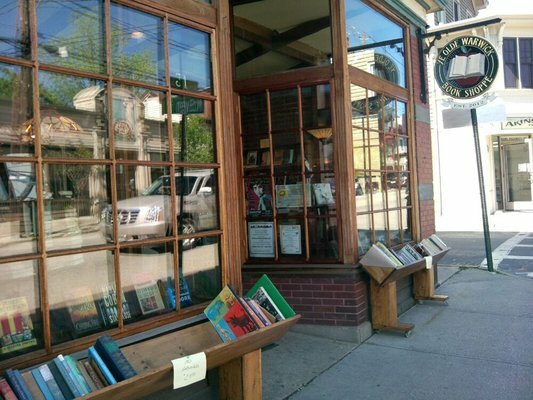 Congratulations to Thomas Roberts and Joseph Justin, who a month ago opened Ye Olde Warwick Book Shoppe in Warwick, N.Y., according to the Warwick Advertiser. The store stocks new, used and rare books and was "the dream" of the owners, who moved to the area last year. "It became apparent very quickly that a small independent bookstore was the one big missing piece to the overall collective commercial shopping scene," Roberts told the Advertiser. "We believe people want to have the whole book experience back in their lives again. A place to come browse, feel, smell and simply enjoy a good book. The excitement from the residents at having a bookstore once again in Warwick has been overwhelming." Roberts has retired as a stage manager, lighting and sound designer in off-Broadway theatre and cabaret. Justin is an actor and stunt man in film and television. On June 12, Anthology users One More Page hosted a launch party and fundraiser for Team Cul de Sac: Cartoonists Draw the Line at Parkinson's (Andrews McNeel), which contains artwork from cartoonists and illustrators inspired by the comic strip Cul de Sac. 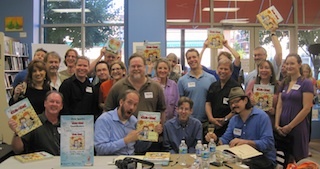 Twenty cartoonist-contributors came to the party to sign books and celebrate with Richard Thompson, the cartoonist behind Cul de Sac (who has Parkinson's), and Chris Sparks, who leads the Team Cul de Sac fundraising efforts. A portion of the day's sales went to Team Cul de Sac, which is part of the Michael J. Fox Foundation. One More Page owner Eileen McGervey described the event this way: "There was cake, snacks, cartoonists/illustrators and fans everywhere, some queuing up to an hour early. The store was quite literally so packed that we had to move a big chair outside to make space. After the event wound down, the cartoonists stayed, visiting with each other and signing each other's books." She called the event "wonderful chaos because there was so much going on, but it was so fantastic."